A few months ago, I received an email from Hard Night Good Morning, a Dallas-based line of skincare products created by D’Andra Simmons. They asked if I would be interested in trying out some of the products, which are sold at Whole Foods. When I said “yes”, little did I know that they would ship me a box filled with almost the entire product line! Even more impressive was the handwritten note from D’Andra sharing important facts about a few of the products. Since I only write on Beautypendence about products that I have personally used, and it takes a while to truly evaluate a skincare product’s efficacy, you may be seeing reviews of HNGM products sprinkled over the next year. First up is perhaps their most beloved product, Facial Cocktail Serum. D’Andra wrote me in her letter, “The line is aloe-vera based, paraben and sulfate free and gluten free as well as vegan.” This serum is also packed with antioxidants, like acai extract, rooibos tea (also known as red tea), and baobab extract (an African fruit). This milky white serum has a smooth, non-sticky consistency with a sweet aroma to it that I haven’t been able to place. You apply 2-3 pumps to your face and neck, and it absorbs into your skin within one minute. Facial Cocktail Serum is intended for use both day and night, and that flexibility is convenient. I’ve used this serum for over a month now, and I do feel like my skin has benefited. While it’s difficult to isolate causality, I believe this serum has helped calm my rosacea a bit. 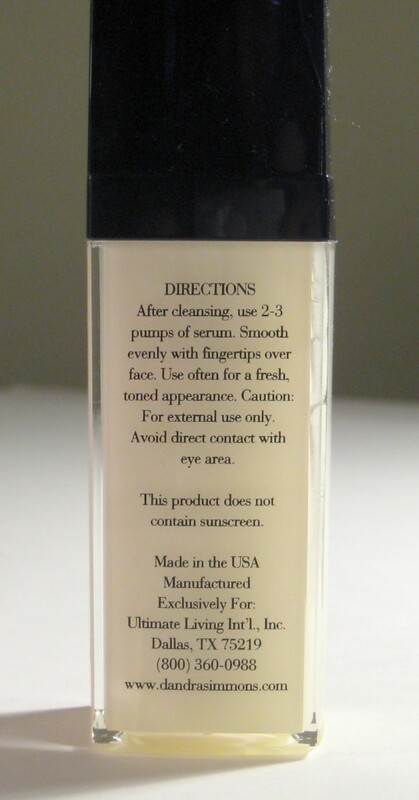 The serum also works well under moisturizer and make-up. The Questionable: The biggest drawback of this product is the cost. At a list price of $69.99 for 1 oz., it’s not cheap. D’Andra writes, “What sets us apart is the amount of actives we use in each product in addition to the aloe-vera base. These actives are expensive but well worth it in my opinion.” For comparison sake, the Estee Lauder serums I was previously using are $52-55 for the same amount of product. Also, the packaging is very attractive, but both the black cap and and the black casing around the pump cracked. But the pump still worked just fine. However, when I thought I was almost out, I pulled out the cylindrical container housed within the rectangular ivory base and saw that there was still a good amount of serum in there. Good thing I looked! The Verdict: If using a vegan product made with high-quality organic ingredients is important to you, and you have the disposable income, then this is a great serum for you. I’m lucky to have relatively good skin, so I don’t know that I need all the extra bells and whistles associated with the higher price of this serum. However, after a month-plus of use, I can see why so many people love this product. This entry was posted in Vanity and tagged aloe vera, Facial Cocktail Serum, gluten free, Hard Night Good Morning, organic, paraben free, review, serum, skincare, sulfate free, vegan, Whole Foods on July 10, 2012 by jenn. Oooh yes, I do struggle with the idea of buying expensive face serums too. A part of me questions their prices and their iffy results! I don’t have nice skin at all! And I always struggle to find a serum that is both good for my dry skin and acne. A side note- isn’t it great that Whole Foods has local-based beauty goods? 😀 I know you’re based in Austin but but HNGM is still Texas-based. I love that! Without a doubt, I spend more money on serums than any other beauty product I use. But I think it’s really worth it. It may not be that I need it so much now, but I do believe all those good ingredients will help my skin as I age. Oh, I believe that too! Serums sink into skin a lot easier than creams and I feel like they’re more potent too. I am currently using the Acure Organics seriously firming facial serum (as investment really, seeing as I’m only in my 20s) and it’s amazing. Even the price- at $23 🙂 Which serums are you currently loving right now? I found your blog/website last night and fell in love. I was about to purchase the Estee Lauder night repair serum and noticed it does contain parabens. Is there a night serum you would recommend as an alternate if I can’t get around the paraben issue? Thanks so much, Natalie! I appreciate your kind words. I have two paraben-free recommendations that might be worth a look. Tata Harper has a Rejuvenating Serum that I tried for a short while. She’s big on organic and naturally formulated ingredients. You can find Tata Harper at Neiman Marcus. 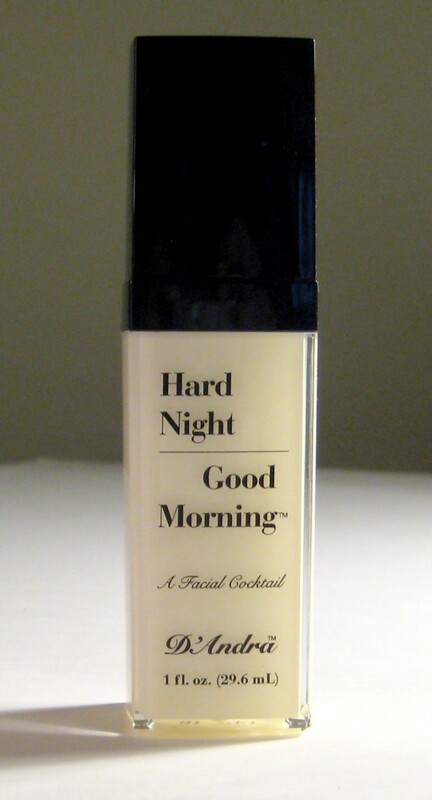 Also, I thought Facial Cocktail Serum by Hard Night Good Morning was good. I didn’t love the packaging, but the serum is made up of great ingredients. I’m not sure where you’re located, but HNGM is sold at Whole Foods Market. I used a sample of this that I was given at Whole Foods. Applied as direct and now I’m sitting here with a red, itchy, bumpy rash all over my face and neck! 🙁 I totally regret using that sample!!! Oh no, Liz! I’m so sorry! You may want to review the ingredient list to try and figure out what caused a reaction for you. Everyone’s body chemistry is unique, so unfortunately, you never know what’s going to work for one person to the next. I saw this on TV & it looks interesting. I do like that it is Organic & no Parabens. Im presently trying Argan Active Serum & the Platinum Oil. I absolutely love it so it would be hard to change since this one is working for me, but it looks like a lot of research has gone into this line by D’Andra Simmons. Im also using a 24 karat gold argan eye serum that is doing amazing things to my puffy under eye bags. My skin is glowing at 70 yrs old, but I like the presentation of these new products by D’Andra & might try it. Its hard to change once you find something that really works & this Argan Active line is super expensive as well but its working. I lost 25 yrs on my face & neck & only been using it under 3 mos. Hmm, I’m not sure. There is a website with an online store, but I’m not sure if they ship to Australia.